Rare Earth (RE) metals have been found to form a number of novel structures on silicon, depending on the substrate orientation and preparation conditions. One of the more interesting structures is that formed at monolayer (ML) coverages on the Si(111) surface, so called "two dimensional" (2D) silicides. This silicide is known to form for most of the trivalent rare earth metals. A very similar structure is also formed under similar conditions on the Ge(111) surface, though this has not been as thoroughly investigated. The 2D silicide may be of technological interest. Unusually low Schottky barrier heights of 0.2–0.3 eV have been recorded for RE silicide on n-type Si. The novel structure may also have interesting magnetic properties, and could form a useful template for further growth. The 2D silicide is formed when 1 ML of RE metal (e.g. Er, Ho, Tm) is deposited onto the clean 7 × 7 reconstruction of Si(111) and subsequently annealed to around 500 °C. The anneal causes the surface to reconstruct and a novel interface structure is formed. A single atomic layer of rare earth metal is located above the Si substrate in so called T4, three fold hollow sites. 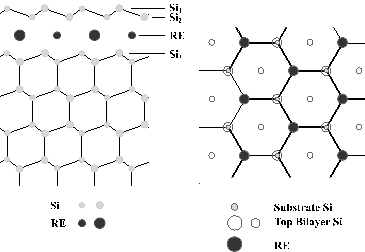 Above the RE the silicide is terminated by a bulk like silicon bilayer, the orientation of which is rotated by 180° with respect to the substrate. The structure is shown schematically in Figure 1. These 2D silicides have been extensively studied using a variety of techniques. The York SPG have used <acronym title="Medium Energy Ion Scattering"><abbr title="Medium Energy Ion Scattering">MEIS</abbr></acronym>, LEED and <abbr title="Scanning Tunneling Microscopy"><abbr title="Scanning Tunnellling Microscope">STM</abbr></abbr> to investigate their properties (see further reading). It has also been seen that similar structures will form using Ge(111). Although not as many examples are known it is expected that such 2D germanides will form for all the trivalent REs, as for the silicides. A number of papers have been published on rare earth silicides, both by the York group and others. A selection of references is given here.